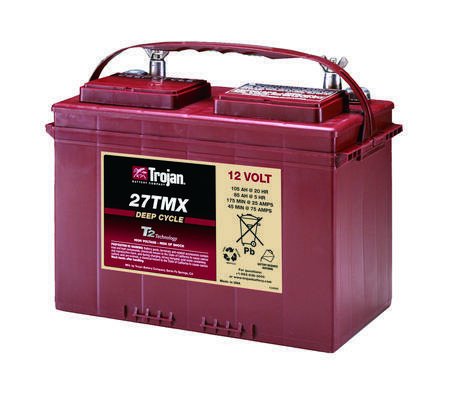 The 105Ah deep cycle batteries from Trojan (27TMX) are probably one of the most popular sizes in the deep-cycle range. They are widely used across the UK in caravans, motorhomes, boats and general solar and wind energy applications. At 105Ah, the XV31 can power most electronic devices - this battery is a true all-rounder. Trojan’s Alpha Plus Paste is a proprietary, high-density paste formulation precisely engineered to deliver outstanding battery performance. This high-density paste optimizes porosity development in the active material utilizing the active material more effectively, resulting in sustained battery performance over a longer period of time. Trojan’s T2 Technology introduces a patent-pending T2 metal agent into our Alpha Plus Paste, further strengthening the electrochemical processing capabilities of Trojan’s Alpha Plus Paste. Together Alpha Plus Paste with T2 Technology increase both sustained capacity and total overall ampere-hours, resulting in more operating power for your application. It’s a key reason why Trojan batteries consistently outperform the competition. Trojan’s grid technology is a lead antimony alloy grid mixture formulated specifically for use with Trojan’s Alpha Plus Paste with T2 Technology. The grid formulation provides exceptional structural adhesion between the Alpha Plus Paste and the grid frame. Thick grids reinforce the strength of the frame and reduce corrosion. The overall grid configuration is optimized to enhance current flow through the grid network providing exceptional battery performance, reducing downtime and lowering maintenance costs. Exclusively available in Trojan batteries is our Maxguard T2 advanced separator. Trojan’s Maxguard T2 separator features a multi-rib geometry which keeps acid channels open longer, enhancing electrochemical processing while reducing the risk of stratification. Maxguard’s proprietary rubber-based material inhibits antimony transfer between the positive grids and negative plates; a protection not available in many other competitor batteries. A newly fortified, thick back web provides even greater separator strength resulting in a more robust battery, with increased protection against failures caused by separator degradation. Trojan’s Maxguard T2 advanced separator sustains performance providing exceptionally longer battery life and significantly lowering your operating costs. Many batteries are fitted in areas where they can be knocked and bumped around or splashed with oil, petrol and diesel. The unique mauve coloured polyproylene outer housing of all Trojan batteries is rigid enough to keep the internal plates and electolyte well compressed, but durable enough to last a lifetime.